This is my original pattern that started my fishing career. I originated this pattern in May of 1962 to catch trout. I had no idea that this fly would hold so many world records and catch so many different fish. There’s hardly a fish that couldn’t be caught on a Teeny Nymph. 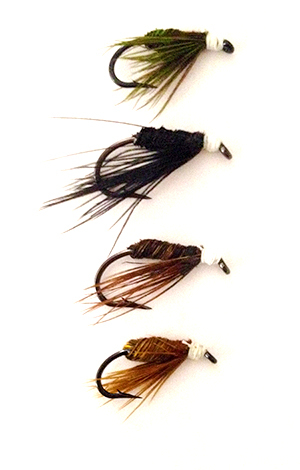 Our size range is from a small size 14 up to a large size 2 hook. This fly is basically tied with one feather so it is fairly simple to reproduce. I can’t say enough good things about this pattern. It rarely let’s me down, no matter where I’m fishing. It should be a basic standby pattern that will soon be one of your all time favorites. I find the Nymph to be more effective than the Leech or attractor pattern when fish are more selective and harder to get to take the fly.